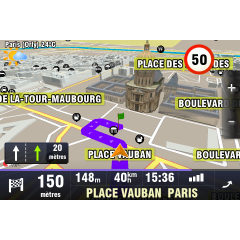 Europe Official licensed GPS maps that work with Mimi Oem Style Aftermarket Multimedia Systems. If your country is not included, please contact us for more details. Speed Camera Warnings protect your wallet. Speed Limit Sign on Map with adjustable audio warning and comprehensive settings for your safety. Lane Assistant tells you which lane to take. Use API function calls to navigate your mobile client to given GPS coordinates. Change the size of application window using API functions. Points of Interest in comprehensive categories for easier search. MultiStop Route Planning with ETA for each stop. This functionality is available also via API function calls. Maps Stored on the Device to save your data for more important stuff. Navigation instructions are available also when application is hidden in the background. RealTime Traffic lets you know what lies ahead. Recalculate route automatically or manually to avoid traffic jams. * Package Contents You will receive a SD Card with the GPS Software, and details on how to activate it. * Non - Transferable - Once registered this software cannot be transfered/used on another device. * GPS Returns Policy Once Navigation software has been used, registered or packaging seals have been broken, No refunds will be awarded.